RF Surgical Systems Inc. (RFS), the market leader in retained surgical item detection, today announced the appointment of John T. Buhler as President and Chief Executive Officer. Mr. Buhler is assuming the role from Kevin Cosens, whose seven years of service helped establish the company’s strong foundation. Mr. Buhler brings more than 30 years of medical technology industry leadership experience to RFS, most recently as President & COO of Natus Medical (Nasdaq: BABY). He was previously President & CEO of SenoRx Inc. (Nasdaq: SENO). Mr. Buhler’s experience also includes executive-level positions at GE, Ultrasonix and Diasonics. He has extensive experience managing high-growth companies and crafting critical strategic initiatives. About RF Surgical Systems, Inc.
RF Surgical Systems, Inc. is the market leader in the detection and prevention of retained surgical items. The RF Surgical Detection System is the preferred solution in more than 300 U.S. hospitals and surgical centers. A number of US News & World Report "Honor Roll" hospital recipients recently joined the fast-growing list of care providers benefiting from the RF Surgical Detection Technology. RF Surgical Systems is based in Bellevue, Washington, with R & D facilities in San Diego, California. U.S. patents protect the advanced technologies used in the RF Surgical Detection System. Regulatory clearance to market the system was granted by the U.S. Food and Drug Administration in November 2006. 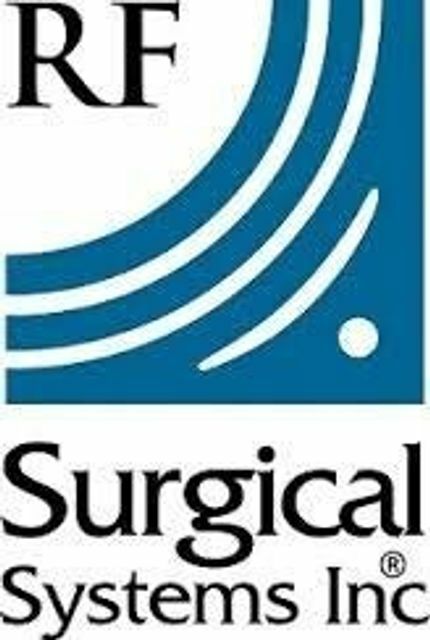 Additional information about RF Surgical Systems, Inc. can be found at www.rfsurg.com.